DETROIT, MI--(Marketwired - Jan 14, 2014) - In a press conference on the main floor of the (NAIAS) North America International Auto Show, VIA Motors announced today that it has received an $80 million purchase agreement from Sun Country Highway to electrify hotels and other business as part of a transcontinental electrification project. Bob Lutz, former GM vice chairman and a leading advocate for extended range electric vehicles, spoke at the press conference along with top executives from VIA Motors, Sun Country Highway and a representative from Best Western Hotels. The privately funded electrification project called Sun Country Highway, was launched by founder Kent Rathwell, and has placed over 1,000 charging stations across Canada to allow electric vehicle owners to travel coast-to-coast with free charging. In addition, it will provide charging for the business' own electric shuttle vans and trucks in the next phase. "In phase one of the project we electrified hundreds of businesses across the country including placing about 100 chargers at Best Western Hotels," said Rathwell. "In phase two, we will deploy VIA's electric trucks and vans and have already placed an $8 million order with a deposit VIA for the first 100 vehicles. We have signed a purchase agreement with VIA committing us to about $80 million of electrified vehicles overall, to meet the demand of the expanding project," concluded Rathwell. 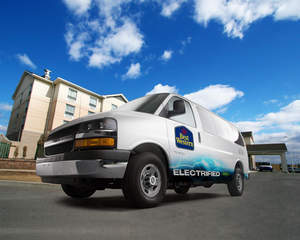 The Best Western Seven Oaks in Regina, Canada will be the first Best Western hotel to offer electric shuttle van services in North America. The hotel owner, Glenn Weir spoke at the press conference and stated, "Best Western is excited to deploy this ultra clean, economical technology. We look forward to providing our guests with clean electric shuttle services and free charging for their own electric vehicles." "VIA is pleased to supply Sun Country and Best Western with the world's cleanest most economical shuttle van," said John Weber, CEO VIA Motors. "VIA's rugged, four wheel drive, extended range technology is ideal for Canada's extreme weather conditions and extended range driving," concluded Weber. At the press conference, Bob Lutz presented the world's first solar powered extended range electric pickup truck by VIA with a solar powered bed cover option. Sun Country Highway created the world's largest universal fast charging network from coast to coast across North America, making nearly 90% of Canadian highways accessible to electric vehicles for free charging. It utilizes a market-driven advertising model similar to offering free Wi-Fi to sell coffee. The "New Economy" Clean Tech Awards named it the "Best Automotive Solution of 2013." Best Western International is the world's biggest hotel family with more than 4000 hotels in over 100 countries and territories worldwide. Best Western Seven Oaks Hotel in Regina, Canada will the the first hotel on the Sun Country Highway to in stall fast charger and deploy VIA electrified Hotel Shuttle Vans.